Preheat the oven at 200C. Place the almonds whole or roughly chopped (depending on whether you prefer the cookies to have whole or chopped almonds inside) on a baking tray and sprinkle with some water. Bake them for 7-8 minutes, being careful not to burn them. Use an electric mixer, to mix the butter and the icing sugar (100g/3.5 ounces), for about 20 minutes, until the butter is creamy and fluffy, like whipped cream. (It is very important that the butter is at room temperature.) Add the vanilla extract, the rose water and the ouzo and blend; add the baked almonds and blend again. In another bowl, blend the sifted flour and the baking powder. (It is very important to sift the flour, so that the cookies will become light and smooth.) Gradually add the flour into the butter mixture (from step 2) and work the mixture with your hands, until the ingredients are combined and the dough is soft and easy to work. You will need 450-500g of flour, depending on the flour. Preheat the oven to 200C; layer the bottom of 2 baking trays with parchment paper and form the kourampiedes. Roll 1-2 tbsps of the dough into a ball, place on the baking tray and push with your finger in the middle, to form a little dimple. Continue with the rest of the dough. Place the baking trays with the kourampiedes in second and fourth grill of the oven and turn the heat down to 180C. Bake for approx. 20 minutes, until they have a very faint golden tint and are cooked through. Be careful not to overcook them. Leave them aside to cool down for a while. If you try to lift them, while still warm, they will break. 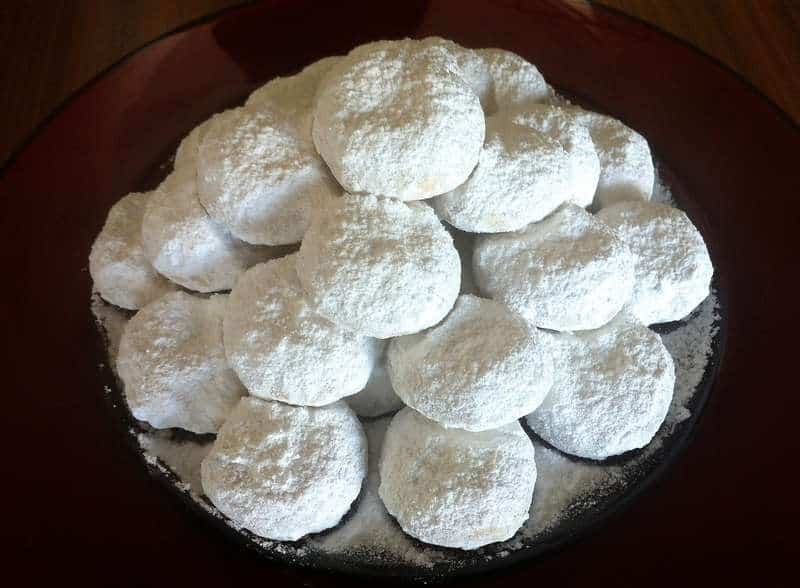 In a large bowl, add 500g/18 ounces of icing sugar and dip the kourampiedes (in batches) in the sugar, rolling them around, so that the sugar sticks on all sides. Place on one or two large platters. When done, sift the extra 500g/18 ounces icing sugar over the kourampiedes. Hello Eli, Thanks for the recipe. What is cow milk butter. I have never used or seen this ingredient. It is okay. It is just butter. I got it. One note should be added to the instructions, and it’s kind of obvious but I overlooked it: Let the almonds cool completely after toasting. I melted my wonderful creamed butter :(.